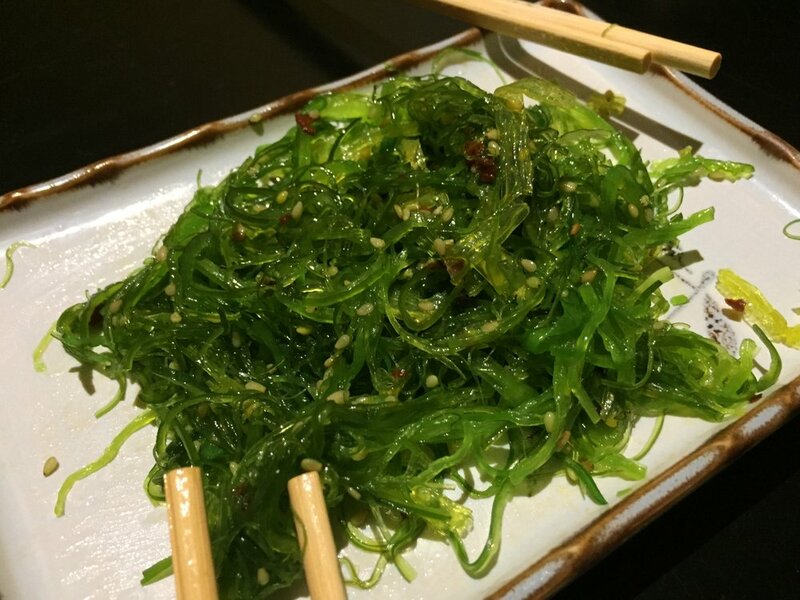 397 E Altamonte Dr, Altamonte Springs, FL 32701 Order Hana Sushi - Altamonte Springs quickly and easily online for delivery. iCrave Delivery offers delivery from the best restaurants in the Altamonte Springs area straight to your office, hotel, or home! 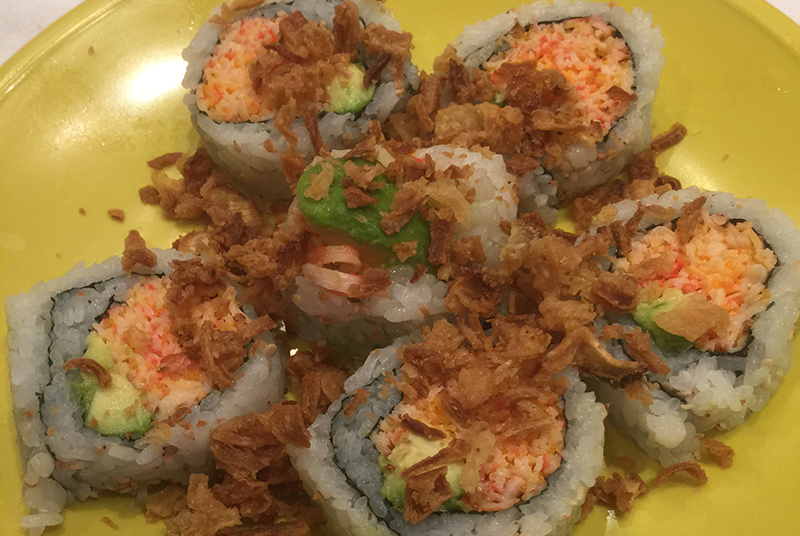 Shrimp Tempura, Avocado & Krab, Masago, Mayo, tempra flakes, topped with Eel Sauce. Krab Stick, Avocado & Cucumber. Two pieces of Shrimp Tempura, Cucumber, Avocado, Masago & Mayo. 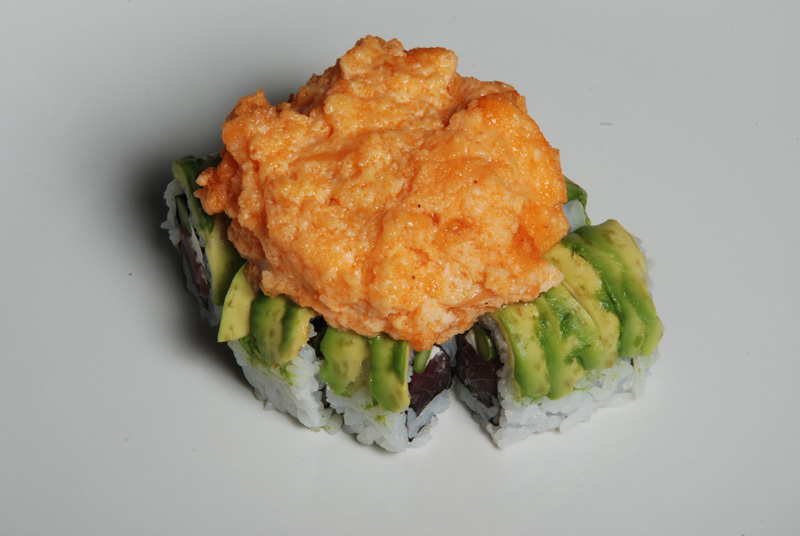 Shrimp Tempura, Cucumber, Cream Cheese, Avocaado, Spicy Sauce&Tempura Flakes, topped with Eel Sauce. Fried dumplings stuffed with krab and cream cheese. Raw, thin sliced Angus beef with ponzu sauce. Raw, thin sliced tuna served with ponzu sauce. Slightly deep fried avocado stuffed with spicy tuna & krab. Topped with spicy sauce. 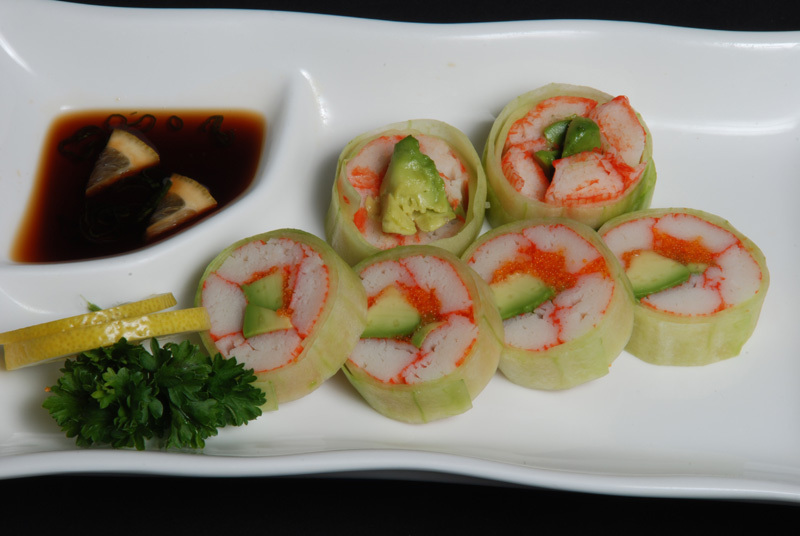 Your choice of krab, octopus or shrimp over sliced cucumber with ponzu sauce. Grilled chicken topped with ginger salad. Avocado and raw krab mix with mayo topped with ginger salad. Raw Angus beef tataki topped with salad. Raw tuna tataki topped with ginger salad. Raw chopped seafood topped with ginger salad. 6 pieces of sushi and California roll. 6 pieces of sushi, tuna roll and California roll. Assorted fresh fish (raw) over sushi rice. 3 rolls of California roll. Shrimp Tempura roll, Japanese Bagel roll and Tuna roll. 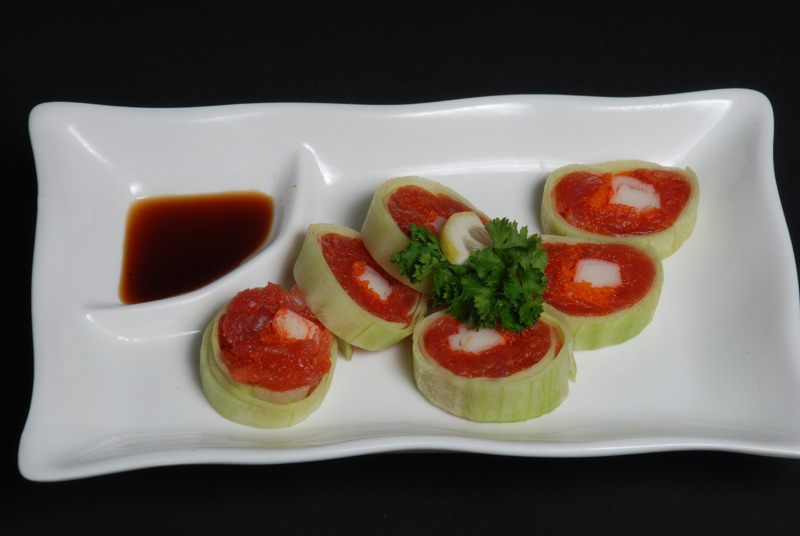 Served with California Roll, Gyoza, Harumaki, Steamed Rice & your choice of Soup or Salad. Chef's choice of Sushi, Sashimi & 4 rolls for 2 people. 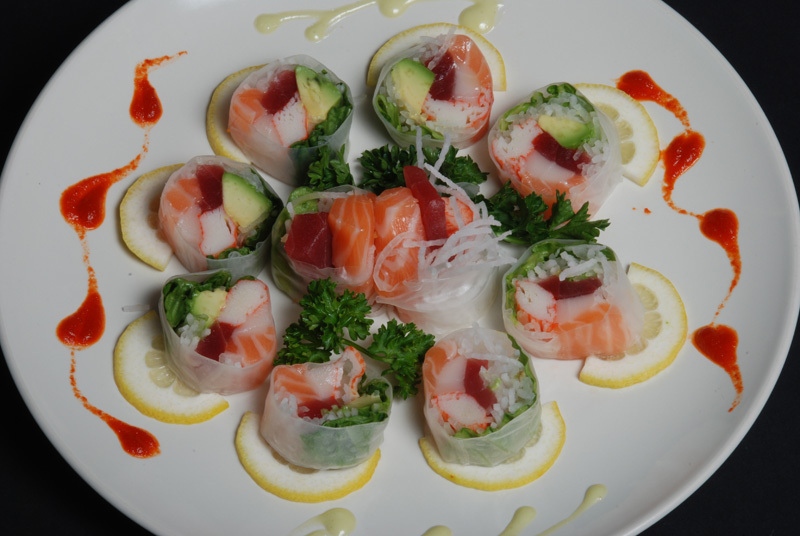 Includes Casey Roll, C&S Roll, Spicy Tuna Roll & Krab Special Roll. No substitutions. Chef's choice of Sushi, Sashimi & 6 rolls for 4 people. 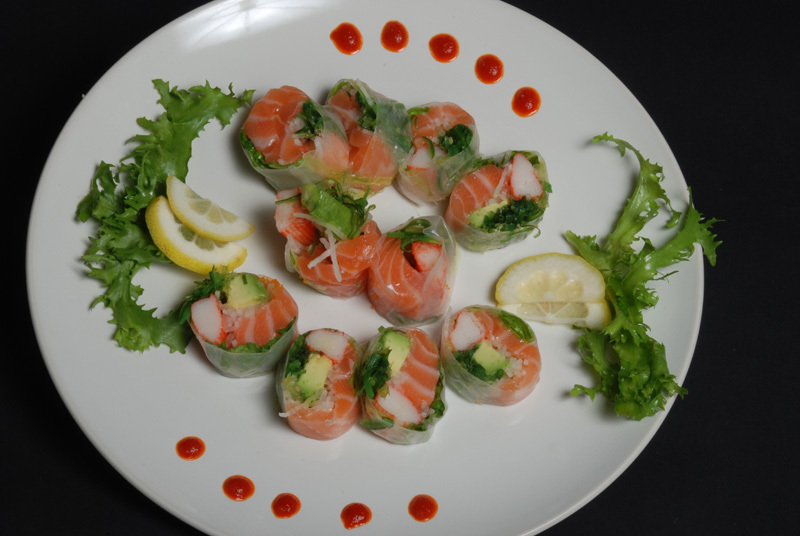 Includes Casey Roll, C&S Roll, Spicy Tuna Roll, Krab Special Roll, Mexican Roll & Alaskan Roll. No substitutions. 6 Rolls; Casey Roll, Philly Roll, Spicy Tuna Roll, Krab Special Roll, Mexican Roll & Alaskan Roll. No substitutions. 12 Rolls; Casey Roll, Philly Roll, Spicy Tuna Roll, Krab Special Roll, Mexican Roll, Dynamite Hamachi, Florida Roll, Katsu Roll, Lava Roll, Rainbow Roll, Shrimp Tempura Roll & Alaskan Roll. No substitutions. Assorted Vegetables battered & deep fried. Chicken & Assorted Vegetables battered & deep fried. Shrimp & Assorted Vegetables battered & deep fried. Shrimp, Scallops, Mussels, Lobster, Fish Fillet & Assorted Vegetables battered & deep fried. Breaded & deep fried pork, served with apple sauce. Breaded & deep fried chicken breast, served with apple sauce. Thick noodle in soup with a side of Shrimp & Vegetable Tempura. stir fries thick noodle with your choice of meat. Gyoza, Harumaki, Shrimp & Vegetable Tempura, 4 pcs. of Sushi, California Roll & your choice of meat. 10 pcs. of Chef's choice of Sushi, Japanese Bagel Roll & Tuna Roll. 12 pcs. of Chef's choice of Sushi, Mexican Roll & Spicy Tuna Roll. 20 pcs. of Chef's choice of Sashimi. 24 pcs. of Chef's choice of Sashimi. Assorted 12 pcs. of Sashimi over Sushi Rice. Tuna, Yellow Tail, Masago Roll with Snapper and Baked Spicy Mayo on it. 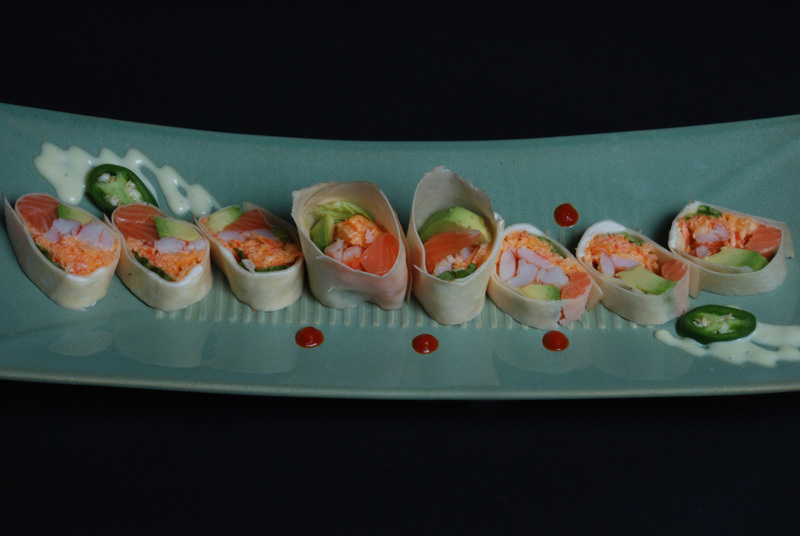 Shrimp , Krab SP, SMK Salmon, Cream Cheese, Avocado, Wrap with Crape. Spicy Tuna Roll topped with Eel, Avocado and Eel Sauce. Egg, Canpyo, Cucumber, Carot, Asparagus & Avo. Sweet Potato, CC & Nuts. Cucumber, Avocado, Asparagus, Lettuce, Spinach & Carrot. Cooked Escolar, Masago, Krab, Avocado, Lettuce & Radish. Rolled with Rice Paper. Escolar, Tuna, Salmon, Avocado, Krab, & Radish w/ Sauce. Rolled with Rice Paper. Shrimp, Krab, ,Cream Cheese, Avocado & Radish, Lettuce,w/ Eel Sauce. Rolled with Rice Paper. Seaweed Salad, Salmon, Krab, Avocado, Lettuce & Radish. Rolled with Rice Paper. 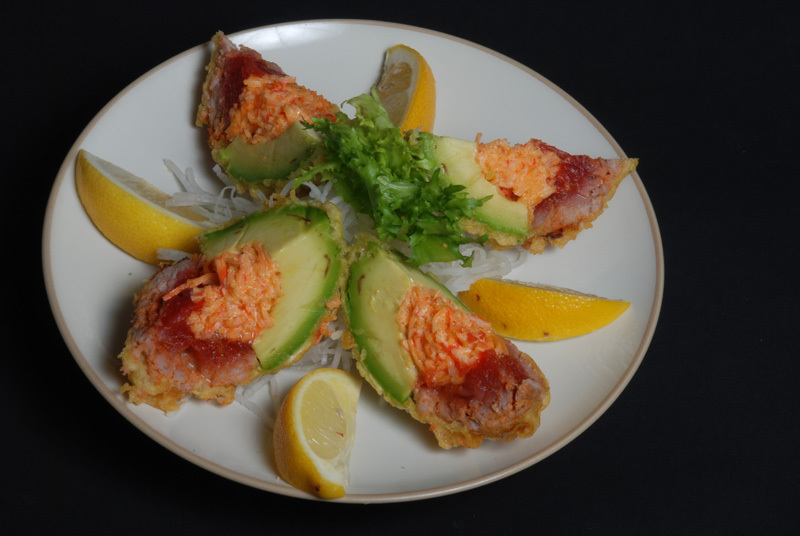 Shrimp Tempura, Avocado, Cream Cheese & Deep Fried, topped with Eel Sauce. Rolled with Soy Bean Paper. Real Crab, Cucumber, Avocado, Lettuce, Mayo & Deep Fried, topped with Eel sauce. Rolled with Soy Bean Paper. Cucumber, Avocado, Asparagus, Carrot & Deep Fried, topped with Eel sauce. Rolled with Rice Paper. Salmon, Krab, Cream Cheese, Scallion w/ Ponze Sauce. Rolled with Cucumber. Eel, Egg, Salmon Skin & Cream Cheese. Rolled with Cucumber. Spicy Tuna, Krab & Masago. Rolled with Cucumber. Krab, Avocado & Masago. Rolled with Cucumber. 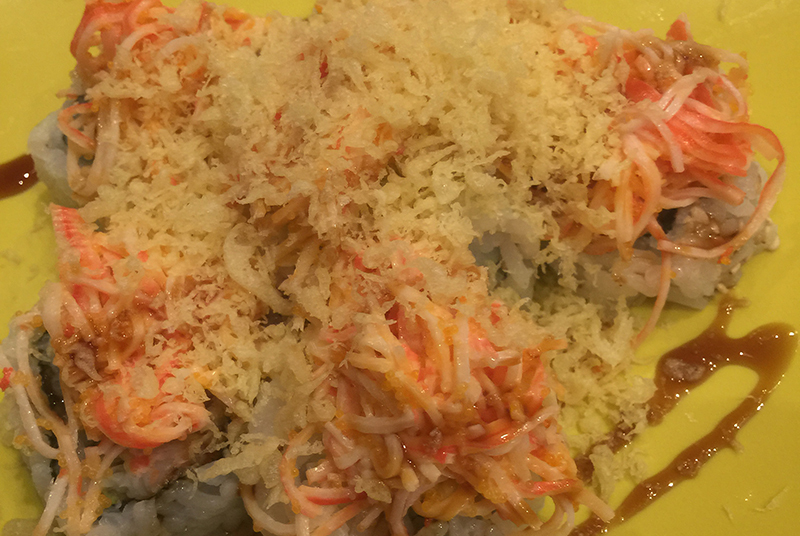 California Roll Topped w/ baked Spicy Shrimp, Krab, mayo & masago, fried onion. Shrimp Tempura, Cream Cheese, Avocado Topped w/ Smoked Salmon and Eel Sauce. Real Crab, Mayo, Avocado, Lettuce & Cucumber. Escolar, Cream cheese, Asparagus, Eel Sauce & Deep Fried. Krab, Mango, Masago & Mayo. Tuna, Avocado & Tempura Flakes. Tuna, Yellow Tail, Masago & Spicy Mayo. Salmon Tempura, Avocado, Lettuce & Mayo. 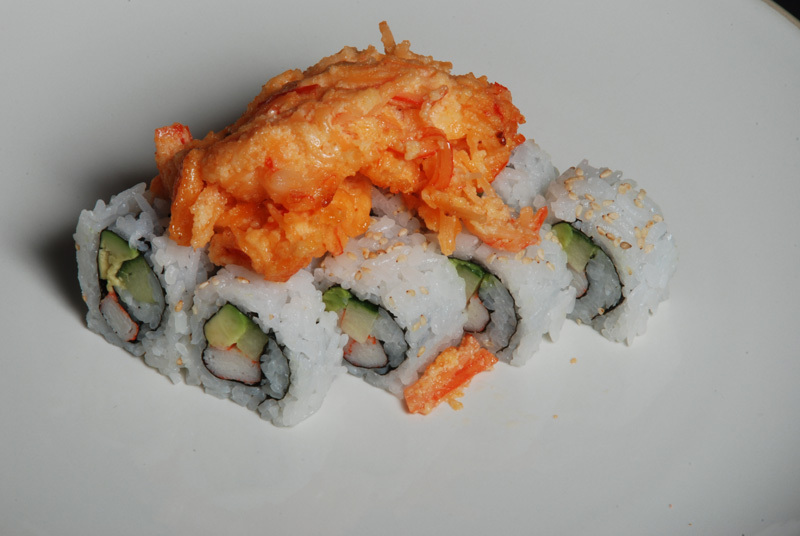 Shrimp Tempura, Soft Shell Crab, Cucumber, Asparagus, Masago, Cream Cheese & Spicy Mayo. Asparagus, Krab, Topped w/ Tuna, Eel & Eel sauce. Fresh Salmon, Cream Cheese & Scallions. Bread Crumb Fried Whitefish, Avocado & Mayo. 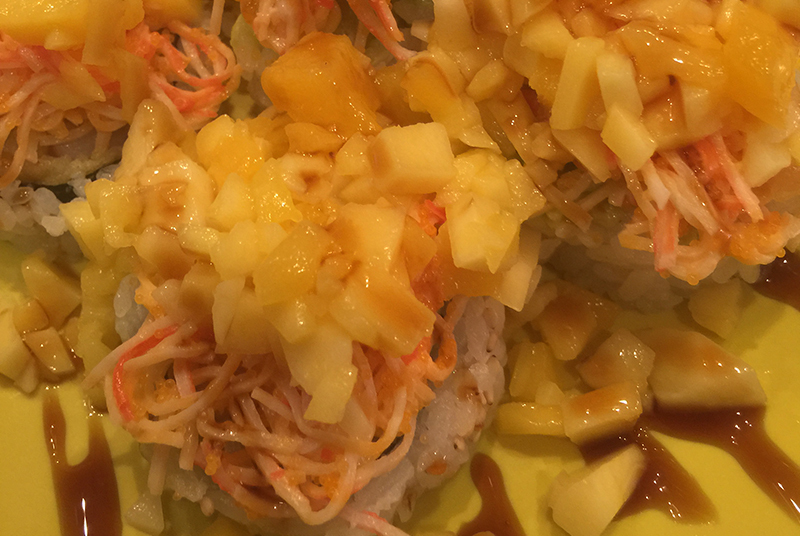 California Roll Topped w/ Baked Scallops, Mayo, Masago &,fried onion. Lobster Tempura, Asparagus, Lettuce & Masago. Tuna, Cream Cheese, Avocado Topped w/ Eel . 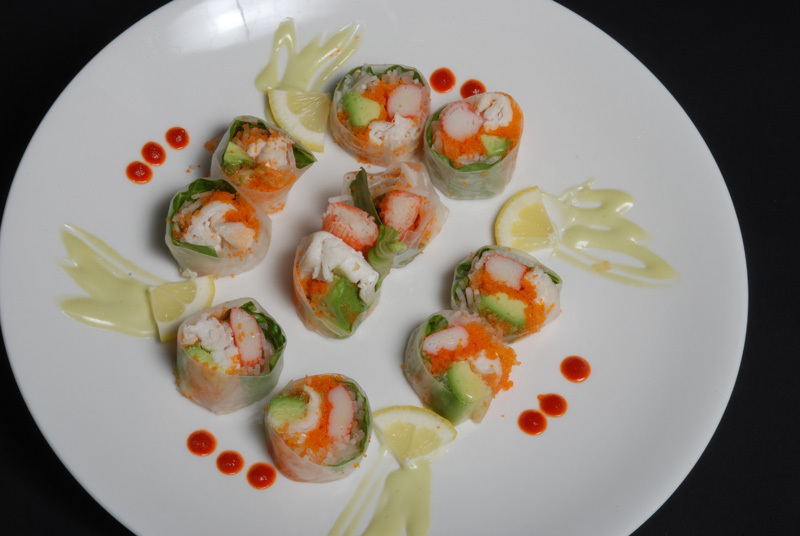 Two pieces of Shrimp Tempura, Avocado, Jalapeno Peppers & Lettuce. Cucumber, Avocado, Cream Cheese, & Shrimp . 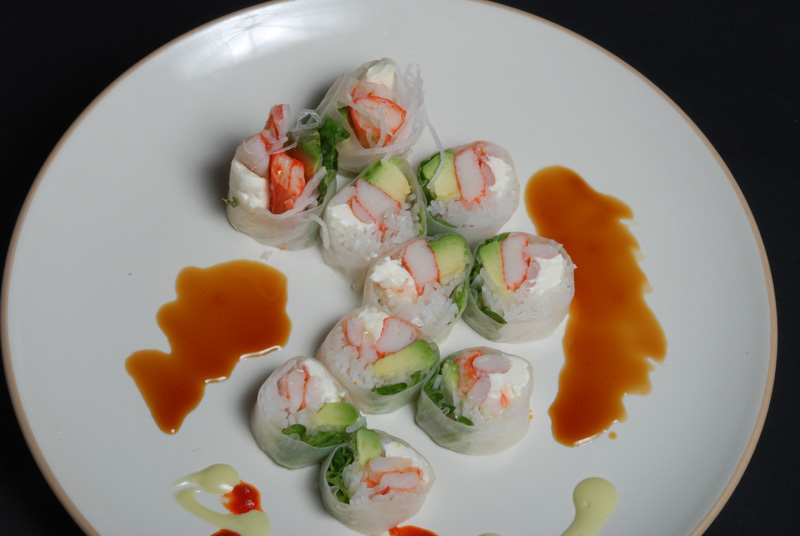 Shrimp Tempura, Cucumber, Cream Cheese Topped w/ Shrimp, Avocado, fried onion & Eel Sauce. Salmon Skin, Cucumber, Avocado, & Masago. Shrimp Tempura, Avocado & Krab, Masago, Mayo, Mango on top. Four pieces of Shrimp Tempura,Cucumber, Avocado, Masago, Cream Cheese, Lettuce & Mayo. 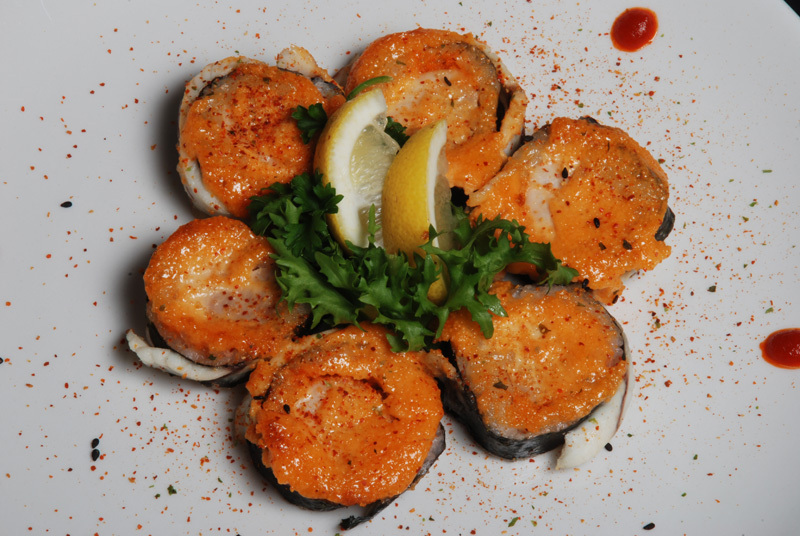 Spicy Seasoned Conch, Masago & Mayo. Soft Shell Crab, Cucumber, Avocado, Masago & Mayo. Tuna, Krab, Avocado & Masago. California Roll Topped w/ Tuna. Tuna, Asparagus, Cream Cheese and topped w/ Avocado, Spicy Conch, Mayo, Masago,Eel Sauce & fried onion. 3pcs of Chicken Tempura with french fries.